The overwhelming feeling of being the one at fault, the cause of the breakdown of the relationship – the persistent feeling of not being enough, hard to love. Feeling like you’re the reason the abuse happened. Often feeling totally broken and alone and as if you had only tried harder, were less argumentative, more giving – then things would not have gone so very wrong. Holding the burden of this weighs heavily on many narcissistic abuse survivors’ hearts after a discard. We dwell on it. We think about it over and over again, searching exactly for what it was we did wrong. Even if you reacted to the abuse in a way that you regret, you have to remember that you were manipulated into it very intentionally and that you can’t blame yourself. 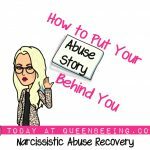 A narcissistic abuser uses highly manipulative tactics and methods to ensure their world goes exactly the way they choose – and often it’s so subtle that it’s undetectable. Even psychologists miss it sometimes. KNOW THIS: It was not your fault. The narcissist will repeat this pattern with any and all they encounter as they use people for narcissistic supply to fill their own needs, part of those needs are having a supply to eventually devalue. They need to have the negative supply as much if not more than the praise and positive supply and blatantly use the ones closest to them to fill this need. The masks they wear to create a persona pleasing to whomever they are trying to impress or hook as supply will begin to slip and usually by this time the survivor is trauma bonded and fully believing all the manipulations are real. The amount of projection a narcissist throws your way at this point is befuddling and confusing so that it truly seems yuo are the one to blame for all things. Remember your truth; your feelings are valid and your experiences were real. After gaslighting, projection and silent treatments, you can begin to feel like you’ve lost your way. But what you experienced happened, and what you felt matters. You need to understand that what created this feeling of responsibility of fault in you was the narcissist’s manipulation, which was intentionally committed against you. They hope they come off looking like the good guy (to themselves at least) and they never take responsibility for the abuse or any wrongdoing. This shines a light on things which could aid in letting go of the blame for you as a survivor. Releasing self-blame can be critical to your healing. I hope that by understanding the cause of the abuse was not you, the survivor, and the responsibility lies with the abuser alone, you can begin to let go of that blame which may hold you in a state of internal pain or shame. To begin to disbelieve the fault the narcissist has trained you to believe is yours will increase your ability to venture toward deeper self-love. If you have experienced this feeling of being at fault what are some ways that helped you to heal? Maybe you are stuck there right now, what thoughts are in your mind that keeps you from letting go of this blame? Share your thoughts and experiences in the comments below. Not only could it help you find some peace, but you may help another survivor to know that they are not alone. Thanks for reading this post! 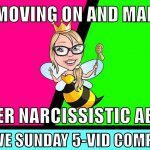 My name is Lise Colucci and I am one of the certified life coaches at QueenBeeing. Learn more about me here or schedule a one-on-one coaching session with me here.